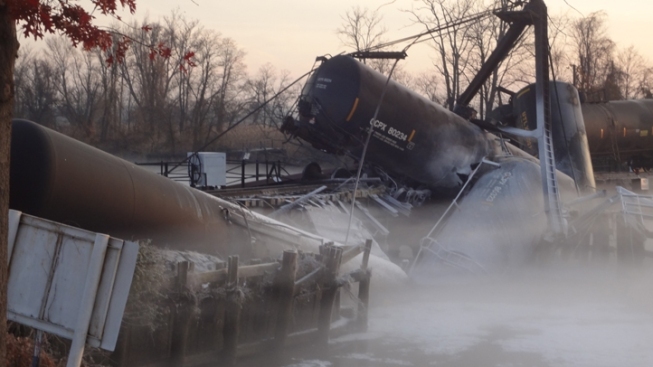 A Conrail train derailed in Paulsboro, N.J. Friday just before 7 a.m.
Six New Jersey state troopers are the latest to sue over a chemical released last year when a train derailed. The troopers, who responded to the Nov. 30 accident, say the train company Conrail put first responders in peril by ignoring problems in a rail bridge. One of the derailed cars leaked some 100,000 pounds of vinyl chloride. The gas has been linked to several health problems in people who are exposed to it over time. The company has not filed a legal response. But in other lawsuits over the spill, the company has said it should not be held totally liable because it is required by law to move hazardous materials. The Courier-Post of Cherry Hill reports more than 250 people have now sued over the spill. A spokesperson for Conrail says the company will address the claims in court.